Here at Oslo Kaffebar we're proud to currently host the captivating works of local artist and designer Michael Erbach. We are delighted to have Sarah Inhoffen hanging her lovely works of art on the walls of our Art Space. The opening party will take place on Friday 31st March from 8pm and the exhibition running all the way thu until the end of April 2017. Here's a bit of information about Sarah's art: Sarah Inhoffen’s paintings are abstract. Her work is about the combination of color fields and lines. She works predominantly in several layers, whereby old, existing structures are broken, but also influence the new combination. The working process becomes visible in the painting and on its surface structure. A series of thought provocative post-it notes, aimed to make you think about your current state. There's loads of new art on the walls from some great artists, go check it out. After spending many hours conceptualising & building a playful robotic drawing machine, we have found the perfect way of visualising thoughts and ideas by turning “Electric Brain Outputs” into “Analogue Artworks”. The machine will be switched on for a 3 hour private drawing session on the 30th Septemberand will be up and running between 19-22pm at the OsloKaffe Artspace, Eichendorffstrasse 13, 10115 Berlin (Mitte) (Opposite the park across from Nordbahnhof Station). Come along on Friday night to witness the machine in action and see over 50 pieces of analogue art already produced by the machine. The exhibition runs from 1st-31st October 2016. Follow #Drawomatik for progress reports! Sr.Mu's artworks drinks from irony and comic (among other refreshments) in order to quench its narrative thirst. It tells stories emerged from any moment or situation and joyfully revealed by the artist. As a street art performer he is also experimenting with animation. I paint not to cry. I paint because I feel like. I am Mu! I bring you the truth. My truth. Seriously. No, it´s a lie. It´s a joke. I am the best artist of the century but I don´t like egocentrism. The OlsoKaffe ArtSpace proudly host the UK street artist known as "The Toaster". In a solo exhibition of recent works including classic forms as well as abstracted states. Opening Party on the 5th August - Meet the artist. The Toaster is an icon of the street art movement but it's concept was conceived years before this genre existed. On January 1st 1999, three people started to place their Toaster image on the streets. Stickers, stencils and posters were soon all over Britain, Europe and then the world. Their murals adorned walls and they painted the Toaster on flags at the Glastonbury Festival, banners in football stadiums and on the roads of the Tour de France. These were seen by millions on tv. Now 17 years on, one of the original three people relentlessly carries on the project, painting and pasting his Toaster in abstracted forms as well as in its 'classic' original state. These 'classic' style paintings form the basis of his exhibition 'Good Vibrations'. Austrian artist Johnny Mussegg was born in 1952 in Judenburg. After spending six years in Ontario, Canada and 2 years in Switzerland he ́s been settled now in Vienna since 1975 where he lives with his wife Heidi. He works in many different media including drawing, carving, painting, photography and super 8 films. The drawings exhibited here were dreamed up in 1980 when one day after a couple glasses of wine he found some toy stencils, that his daughter had collected from packs of chewing gum. Using the stencils and felt tip pens he started building his characters up out of simple shapes, almost accidentally capturing the spirit of the early 80 ́s. Artists have been asked to produce art work that has been inspired by Ping Pong and Wrongness. Vernissage: Join us on Saturday 4th June from 7pm for a night of art and entertainment. Over a decade of Designer Vinyl Toys on display. With over 100 Vinyl figures including Qee, Lunartik in a Cup of Tea and TITANS Vinyl Figures. From Cambridge, U.K. Currently based in Berlin, Germany. In connection with Milwalkies 1st album release the band invited 10 different artists to illustrate one of their songs each, making the release party an art happening as well. 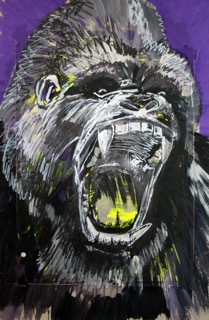 mixed media on canvas, objects , illustrations and walls is what he is doing mostly. Trying to break up the perfect computer generated look of most things today in a lightly destructed look, with cracks and drips. Born on the 25th November 1977, England. From 1996 – 2000 Matt studied product design at the “Birmingham City University. The university was formally known as the “University of Central England or UCE”. After leaving university, Matt worked as a designer in two companies, one as a junior and the other a more senior position. The realisation that he would not be happy working within a company soon became apparent so in around the back end of 2002 he decided to go it alone as a freelance agent. This led him down the new path of working in new ways, mainly from his home studio. A huge learning curve in his career began, and a new path of developing skills in; web design, graphical layout and illustration. At this period of time Matt was working for a wide range of people, from blue chip companies to wacky mavericks. Matt has now found him self working with “Design Toys” and has established himself as an artist. Niels de Jong is born in the Netherlands and currently living and working in Berlin, Germany. Growing up in a family of creatives Niels was always surrounded and influenced by different elements of art. From visiting his grandparents and their wood working shop to watching his father paint and sketch day in day out. In his period of School and Academy Niels was always involved in different fields such as graphic design, 3d modeling, architecture, wood working and finally Graduated in Urban Design (Urban Interior Achitecture). His history in Architecture and his love for nature and the outdoors is projected onto his current paintings and art works. Niels uses both these elements by combining geometric and organic shapes, looking for the perfect composition where the the result feels like calculated precision.